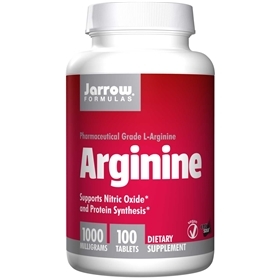 L-Arginine is an amino acid that plays an important role in several important pathways, including the synthesis of proteins. It is also involved in the the production of creatine phosphate, needed to produce ATP, and the synthesis of nitric oxide, a secondary messenger involved in blood flow. Take 1 tablet 1 to 2 times per day or as directed by your qualified health care consultant. Easy-Solv® tablets are designed to disintegrate within several minutes of ingestion. NOTE: If you have a medical condition (especially hypotension or herpes), are pregnant, lactating, trying to conceive, under the age of 18, or taking medications (especially for blood pressure), consult your health care practitioner before using this product. Cellulose, stearic acid (vegetable source), magnesium stearate (vegetable source) and silicon dioxide. Pharmaceutical Grade L-Arginine Hydrochloride made by Kyowa Hakko of Japan.